The 2017 Masters Superbike Championship passed its half way point today at Mondello Park, as it also reached the 100th championship round since it began in 2010. The trio of Superbike races saw an unusual number of incidents, which depleted the field as the event went on, but still managed to produce two of the best on Sunday. 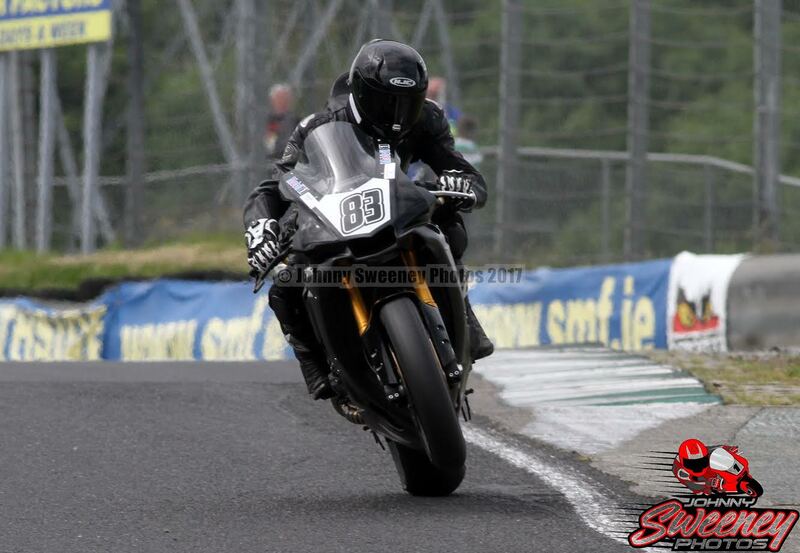 Saturday's race one was a straight-forward win for Richie Ryan riding his Mobil1 Yamaha R1, with the ever improving BMW of Luke Johnstone best of the rest. Peter Moloney took third with his BMW having battled past the R1 of Charles Stuart for the final podium position. Ryan again led in Sunday's first race but by the end of the second lap a resurgent Brian McCormack had emerged from the pack and was beginning to close the gap to the leader. The leading pair traded fastest times for the remainder of the race and with two laps to go McCormack took his BMW into the lead for the first time. McCormack's glory was to be short lived however as disaster struck on the final lap. A big off on the fast entrance to turn three, Calor Corner, robbed the Tramore man of victory and left Ryan to take a comfortable win. Moloney once again passed Stuart to take his best result since round one. McCormack's crash put him out of race three along with Luke Johnston who had also had a race two off. Ryan was therefore left alone on the front row of the grid for the final race and led initially before he too was a faller, leaving Stuart versus Moloney as the lead battle. The BMW rider made a strong challenge for top spot and was attempting to pass Stuart at his favourite turn three, when he had an identical accident to McCormack and lost the chance to take his first Masters win. That honour was left to Stuart who took victory from a pair of Superbike podium debutants, Mark O'Byrne in second and Cup winner Eddie Healy who finished third. Ryan's two wins meant that he maintained an almost unassailable championship lead, despite Stuart closing the gap by four points. Healy achieved a 'Cup' hat-trick to move him into contention in that championship, while Michael Gillan and Ray O'Neill were consistent 'Cup' podium finishers and also closed the gap to Championship leader Andrew Murphy, who suffered a weekend ending crash in race one. The Supersport class was unusually sedate. The top two positions were dominated by Jason Lynn and Ross Patterson as others struggled to keep pace with them. Lynn on board his Walter Bell Suzuki won the opening race by the enormous margin from Patterson and Aaron Clifford. Race two again saw Lynn lead from Patterson but after the race was stopped Patterson reversed the positions off the restart. A crash at Bridgestone put Patterson out and handed the win and championship lead to his rival, with Clifford taking second in a photo finish with Dean McMaster. Race three saw Patterson lead with Supersport 'Cup' hot shot Eunan McGlinchey putting himself in between the normal top two. By the time Lynn got by, Patterson was too far up the road to catch, so Patterson finally took his first win since round five. McGlinchey faded to fifth behind McMaster and Clifford, but still took his second 'Cup' win of the weekend, having crashed out of race two. Graham Whitmore took the other 'Cup' victory, his first, with Luke O'Higgins and Michael Browne the other riders to make the rostrum. Lynn's pair of victories left him with a twenty point championship advantage over Patterson with Clifford trailing by a long way in third place.